It was a very special occasion for the brethren and the many visiting guests of Bootle Pilgrim Lodge No 1473, who gathered at Litherland Masonic Hall to celebrate the special and important milestone in the Masonic career of Gordon Martin in achieving 50 magnificent years as a Freemason. Leading the celebration was Assistant Provincial Grand Master Derek Parkinson, who was accompanied by Ormskirk and Bootle Group Chairman Graham Chambers, the group vice chairman Malcolm Alexander together with grand officer Ron Elliott. The evening’s meeting commenced with the WM Mike Melia, warmly welcoming everyone to the celebration before opening the lodge. Once the lodge’s business had been completed, acting assistant to the PrGDC, Peter Littlehales was admitted into the room. Peter announced that Derek Parkinson was without and demanded admission. 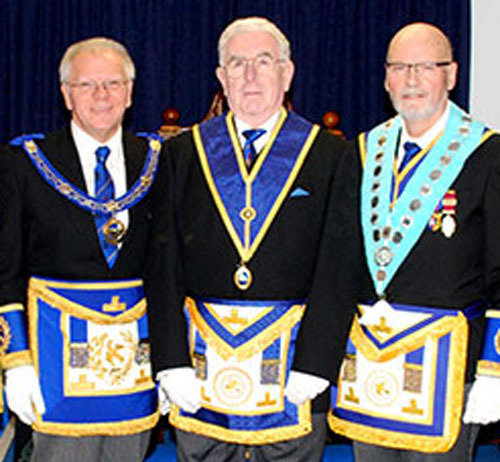 Therefore, he was duly admitted preceded by grand officers and the acting Provincial deacons Ken Mitchel and Howard Dinsdale, Mike warmly welcomed Derek to the lodge and offered him the gavel, which Derek graciously accepted. Gordon was then placed on a seat before the pedestal, as Derek proceeded to deliver his presentation on Gordon’s life and Masonic career. Derek then proceeded to give a detailed account of Gordon’s life. Gordon was born in 1945 to James and Gertrude Martin, Gordon’s father worked for the Marine Engineers Association (MEA), living in Sudbury Road, Brighton-le-Sands, where Gordon began his childhood. Gordon attended St Nicholas School in Warrenhouse Road, and is the Chairman of the Old St Nicholas Association for all the ex pupils who attended the school on that site or it’s annexe in Holden Road. The group has about 60 members and they get together from time to time, meeting in the Hightown Club. During this time in Gordon’s life, he used to have swimming lessons at the former public baths on Balliol Road, Bootle, opposite the former Bootle Group’s Masonic Hall, starting a long association with the area. During his school years, Gordon went to St Nicholas Church Hall where the vicar, Charles Nye, had disbanded the cubs and scouts and replaced them with the Church Lads Brigade, the CLB, and the Junior Training Corps or JTC. The Church Lads Brigade was a youth organisation of the Anglican Church formed in 1891 and modelled on the Boys’ Brigade. It was organised into sections based on age and the Junior Training Corps section was for boys aged 10 to 14 years. It had more military characteristics and was actually part of the British Army and the junior division equivalent to the University Training Corps. After leaving secondary school, Gordon attended Bootle Technical College, again in Balliol Road, enrolling on a mechanical engineer’s course for five days a week and also taking night school classes. Gordon passed his exams and was taken on as an apprentice marine engineer by the Harrison Line at Brunswick Dock. Working on ships and in the fuel injection shop in Hill Street and continuing with his studies one day a week at Bootle Technical College. With a weekly wage then of £3 5s 9d. 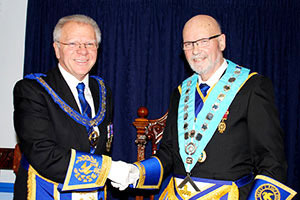 Derek Parkinson (left) being welcomed to the lodge by WM Mike Melia. After completing his apprenticeship and gaining his indentures, Gordon decided a life on the ocean wave was for him and he signed up for the Merchant Navy as a Junior Engineering Officer. His fist ship was an 8,000-tonne cargo vessel, managing to struggle across the Atlantic at 14 knots. As shipping progressed, the ships got larger and larger moving on to the large cargo vessels and despite their size these ships only required 20 to 30 men to crew them and so the smaller ships of the 70s and 80s couldn’t compete financially. The ship owners sold their fleets and redundancies inevitably followed. In 1986 Gordon found himself back on dry land working as an agency mechanical engineer, taking work from the highest bidder. Gordon’s main expertise was in boilers, rebuilding second hand boilers for resale but one job was to design and build a conveyor belt system to move stacks of toilet rolls nine high around a bend to replace the fork lift truck which had inefficiently done the job before. Gordon’s work was quite varied, and one job required him to sign the Official Secrets Act of 1989 when he took on a contract at Aldermaston to commission a new boiler plant built by Foster Wheeler. This led to other similar work with chain grate boilers. These have a continuous chain grate that feeds the coal or other solid biomass source into the furnace in such a way as to make the combustion as efficient as possible. Gordon worked on these at Aldermaston, Guinness and British Sugar. Following on from that Gordon worked on the Joint European Torus (JET) Project at the Culham Science Centre for Fusion Energy near Oxford. The scientists, technicians and engineers working here were using the principle of colliding atoms to release the energy stored within them and capture that energy as a useable fuel source. Finally, Gordon moved to Headland Foods in North Wales. This company’s business was to cook food, put it together as meals and package and freeze them to sell as ready meals for oven or microwave cooking through the major supermarkets in the UK. 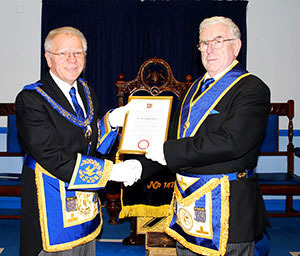 Derek Parkinson (left), presenting Gordon Martin with his jubilee certificate. Gordon was the Services Manager which meant that he was responsible for the mechanical equipment required by any part of the process. One of the problems was that a lot of water was used in the processes and the waste contained fats, starch and other pollutants that couldn’t be put back into the water system. The company had to pay the water companies to treat the waste and so Gordon designed and built a processing step that cleared most of these elements so the water could go into the usual waste systems. This resulted in a Business Energy Award in 1994, and the Managing Director was invited to Highgrove by Prince Charles to discuss the work Gordon was doing as Prince Charles is very interested in water treatment and conservation. The company was eventually bought out by Kerry Foods and Gordon was retained to oversee the dismantling of the plant. Derek then went onto inform the brethren about Gordon’s family life and hobbies; Gordon met Joyce Blease on a blind date, meeting up at Central Station and they were married in 1971. Joyce and Gordon have three children, James and twins Alex and Elizabeth and have six grandchildren ranging from six to 20 years of age. As a relaxation Gordon enjoys watching Liverpool Football Club and had held a season ticket for many years. Gordon also enjoy gardening but his main passion was maintaining and looking after his pride and joy, a Mercedes 280 SL. Derek then gave a detailed account of Gordon’s Masonic career; Gordon was initiated into Bootle Lodge No 1473 on Thursday 6 February 1969 at Bootle Masonic Hall in Balliol Road. Gordon’s father, James Martin was a member of Bootle Lodge and he proposed him for initiation and the proposition was seconded by Alex Ross, Assistant Chief Constable. Gordon’s work commitments around the country prevented him from taking an active part in the lodge until such time as his work had settled more locally, when Gordon was able to progress through the regular offices and installed as WM in 2003. After his year as immediate past master, Gordon took on the charity steward’s job, a position he held in Bootle Lodge until the lodge’s amalgamation with Pilgrim Lodge in 2010, and Gordon continues to be charity steward in the new Bootle Pilgrim Lodge. 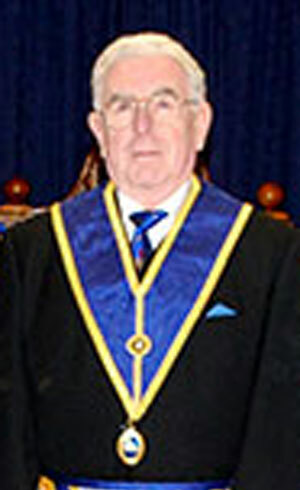 Gordon also had been director of ceremonies for three years and assistant DC for two years for the lodge. Gordon was also Tithebarn representative and five years ago Gordon was appointed as Group Charity Steward until 2016 when he took on the group representative role for the MCF 2021 Festival. Pictured from left to right, are: Derek Parkinson, Gordon Martin and Mike Melia. Gordon’s contribution to the lodge was recognised in May 2011 when he received appointment in Provincial Grand Lodge to the high rank of Past Provincial Senior Grand Deacon. With the presentation being over, Derek handed the gavel back to Mike Melia, who then closed the lodge and the brethren made their way to the dining hall for an excellent festive board, where the celebrations continued. In response to the toast to Gordon’s health which had been proposed by Ron Elliott, Gordon started by saying how happy he was to have been married to Joyce for nearly 50 years, informing the brethren that he promised Joyce that when he retired, he’d take her to all the places in the world he had visited when he was in the Merchant Navy, which he was happy to say they have nearly completed. Gordon also informed the brethren that his father had celebrated both his 50-year and 60-year jubilee in 1975 and 1985 respectively, and remembers attending both of them, commenting that it was a privilege to be able to receive a jubilee like his father before him. Gordon’s father had been a very active member of the lodge and was still remembered by some of the lodge members. Gordon finished his response by thanking everyone for attending and supporting him, giving special thanks to Ron for proposing the toast to his health, Derek for the presentation in the lodge room and finished by thanking everyone for their charitable donations they had given to the MCF 2021 Festival over the last few years. Once Gordon had finished his response the WM Mike Melia stood up and had the pleasure to present him with a gift from the lodge, a set of gold Masonic cufflinks and tie pin. Pictured from left to right, are: Howard Dinsdale, Malcolm Alexander, Graham Chambers, Derek Parkinson, Gordon Martin, Mike Melia, Ron Elliott, Peter Littlehales and Ken Mitchel.